I usually don't shy away from learning about the things that anger me, horrify me, and sometimes break my heart. But with the damn oil spill, I've been avoiding hearing about it as much as I can. I feel so incredibly helpless, and every time I think of it I just want to burst into tears. But today, I saw this new song on Facebook by Kimya Dawson, an artist I adore, and loved it. So I wanted to share it with you. It's called Driving Driving Driving. I have a longstanding love affair with food. As horribly cliche as that sounds, it's pretty true! I tend to go in cycles in terms of cooking more and eating better, versus cooking less and eating worse. I start to feel not so great, get tired of the boring stuff I've been eating, and realize that I need to cook more. I start cooking a lot more, and feeling better and more excited about food again, before I start slowly slacking off... I'm currently in the stage of realizing the food I've been eating isn't making me feel so good, so starting to cook again! Yesterday I spent the afternoon in the sun, watching my sister march in a parade with one of her highland bands. The food that was served there was your usual hot dogs and hamburgers, so I ate a couple veggie (soy) burgers there, despite the fact that those are definitely not on my list of foods that makes me feel good, or even on a list of foods I particularly like (I was hungry, okay?)! But when I got home, I decided that I wanted to eat something healthy, and also something grain free. So I fried an egg (seasoned with herbs) in coconut oil, then heaped steamed kale and baby garlic on top of it. A bit of salt sprinkled on top, and voila! Healthy, grain free, and not too bad on the taste buds. Since I was still hungry after that, instead of turning to my usual snacks of grain based foods, I ate a bunch of the aforementioned snap peas then baked some carrots with coconut oil and a bit of brown sugar. Vegetables for the win! What we eat has a HUGE impact on our overall health and well being. It affects how much we get sick and how long it takes to get better; it affects our moods and emotional well-being; how much energy we have and how well we sleep... What we put into our bodies affects everything. And for different people, different ways of eating are needed! Which is why I like playing with my diet. I love seeing what changes I see in myself from changing what I eat. My newest food experiment is the no-grains thing. I've been reading interesting stuff about grains, and how they probably shouldn't be such a dietary staple for so many people. I want to go entirely grain free for a week once SMUG passes (I'm way too busy until then! ), which should be interesting! Other ways of eating I want to try at some point are a sugar free diet (processed sugar, not foods with natural sugar), a dairy free diet, a paleo diet (minus the meat), and eating raw food more regularly. Maybe eating entirely raw one day a week? The possibilities are virtually endless, and when food is looked at as something interactive and interesting, it's also genuinely fun! P.S. Sorry I've been a bit neglectful of this blog, and that this post might be not so hot! Life has been busy, and inspiration for blog posts has been virtually non-existent. Hopefully that will change soon! I now have a monthly column at Enjoy Life Unschooling called Breaking Pavement! Today, as I walked with my sister and a friend, I was thinking a lot about this column. What to write, what to write… The sun was getting steadily lower, but there was still a fair bit of light, birds singing, and the scent of smoke in the air. My shoes, even though I was only wearing flip-flops, felt like they were trapping my feet, so I slipped them off and spent the rest of our long and meandering walk in bare feet. Ahh, the relief! The joy! The world passes by underneath my feet. When I finally came back inside, soles thoroughly blackened and sun mostly gone, I felt a bit of a letdown. Still no inspiration for what to write. But then I started thinking about walking in bare feet. Thinking about how hardened my feet used to be, and how soft they are now that I’ve been wearing shoes so often. I miss walking in bare feet. So I’ve been determined to go barefoot more often! I like it. It feels good. And I started thinking about why I like going barefoot. What about this no shoes thing makes me so happy? I realized that what it really is, the connection. With shoes, I’m putting yet one more barrier between me and the world around me. Without them, I feel more connected to the dirt-grass-gravel-pavement-mud. To continue reading, head on over here! 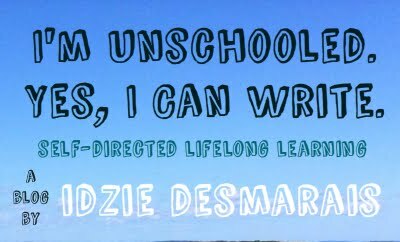 What's one thing you wish people knew about unschooling? I wouldn’t say unschooling, per se, but there is one thing I wish that people would realize: that people, all people (children, teens, adults), don’t have to be TAUGHT to LEARN, and in fact will even learn better when engaged and interested in the subject matter, pursuing learning of their own free will. The belief that teaching is necessary for learning, and that learning is something difficult and un-enjoyable, so that people must be FORCED to do it, is one I find very frustrating. That belief is the biggest thing standing in the way of people understanding unschooling! Head on over to Connected Mom to read the entire interview! P.S. A big thanks to Ronnie for reading over this interview (I was alone in the house when I wrote it, so couldn't rope any family members into reading it) and giving some great feedback that really helped me make this piece better! Come join us for the first ever Summer Montreal Unschoolers Gathering! Time is running short... Less than THREE WEEKS until the start of the first ever Summer Montreal Unschoolers Gathering! We'd love if you would join us, and help make this event a real success! laugh, love, explore, and just hang out! P.S. Feel free to pass the message! On a recent Nightline segment on Unschooling (ABC really likes this topic, it seems! ), something the reporter mentioned stood out to me. Near the end of the segment (which featured the Martin family) she said: "What happens when the learning becomes more sophisticated and her kids need to be exposed to Shakespeare or Twain or Henry James?" And that stuck with me. Because really, does anyone "need" to be exposed to Shakespeare? And by being exposed to Shakespeare in school, do the vast majority of public and private schoolers really develop a deep and abiding love for the famous playwright's work, or do they hate, dislike, or find absolutely useless and/or boring everything they're taught about the man and his writing? Yes, I'm sure there are a very few who actually find Shakespeare, his life and work, to be fascinating, and love learning about him in school. But can anyone tell me that that's even remotely common? I was big into poetry as a kid (I still do love poetry). I'd completely memorize poems that were pages long, and regularly my mother, sister, and I would pull out a book (or a few books) of poetry and take turns picking ones to read out loud, to share with each other. So I came across some of Shakespeare's poetry at a young age. However, none of it ever really appealed to me. As for his plays, since popular culture is steeped in references to and spin-offs from his most famous plays, I knew the basic story to them, and read bits from a few childrens versions. But, as with his poetry, nothing ever particularly caught my interest. Then, just a month or so ago (maybe a bit more), PBS was scheduled to air a production of Hamlet starring David Tennant, an actor whom I adore. So, along with Emilie and a friend, both of whom also happen to adore David Tennant, we settled down to watch. And I was entranced. The archaic language was unsettling for a minute or two, but after that I became absorbed in the story, language, and truly incredible acting. I was surprised at how many lines I recognized, and for the first time ever I really understood why Shakespeare was considered such a great writer. Despite the length (a whopping three hours) I was sad when it was over. How could things have gone differently? Had I been forced to read and dissect Shakespeare's work, would I have been willing to even try watching the performance? And if I had, would I have enjoyed or appreciated it (the language and tragic intricacy of the story, the tortured character of Hamlet)? Art, any art, should be enjoyed and interpreted by the individual, of their own free will. To force someone into "art appreciation", to drag someone to the theater, to force someone to dissect poetry or interpret a painting the way the teacher interprets it (or risk getting bad marks), is to kill art for that person, to kill what enjoyment they may have found in their own time. Enjoyment and interpretation of art is a deeply personal thing, and it angers me when people try to take that away from children and teens. So, please, let the kids discover Shakespeare (or not) on their own terms. If they never find joy in Shakespeare, I highly doubt that will negatively affect their life. But if they're force-fed Shakespeare against their will, I have no doubt that it will have a negative impact! The hostile questioner. "Aren't you ruining your life? How will anyone ever hire you if you don't go to school?" This person is instantly suspicious and disapproving. For whatever reason, be it jealousy that they never had the option of learning (and living more) freely, they are determined not to believe in any alternatives to conventional schooling, and will do anything to disprove whatever you say. Their purpose is not to learn, but to devalue the lifestyle you're living. To invalidate it, and thus validate their own choices as the clearly Right ones. The well-meaning yet ignorant questioner. "But what about socialization?" This individual is simply curious, and entirely uninformed, the questions asked being slightly annoying only because of how often you've answered them before! This person hasn't usually thought through the questions at all, they're just repeating things they've heard before in regards to home and/or unschoolers. They really do want to know more, and just haven't really thought much about any type of education, other than school, before. The confused questioner. (After having just explained unschooling) "So, is your mom a good teacher...?" This person, no matter how many different ways you try to explain things, just isn't grasping the concept. They're not confrontational or anti-unschooling in the slightest, they're just either very set in their ways of seeing the world, so much so that nothing else even computes, or you just think in a way that's too different from them, and can't explain things in a way that they'll get. The cautiously optimistic questioner. "So, you can get into university?" The idea strikes a chord with this person. They kind of like it, but aren't quite sure they should, and are worried they're missing something crucial. This is one of the most rewarding scenarios for an unschooler who wants to share this philosophy with others. This person is very likely to be helped by finding out about unschooling! And, recently at the anarchist bookfair, I've been exposed to another type of questioner. I'll call those who approach things this way the constructive questioner. They're coming from a place that's already supportive of freedom, and their questions are intelligent and well thought out. Their desire is to learn, and build on the basic knowledge they have, not to tear down the idea. I found that quite delightful, and really enjoyed the panel discussion I was a part of there. This post doesn't really have much of a point, I'm afraid. It simply came about because of a few vague thoughts about ll the different types of questions I've been asked about unschooling, and a desire to get back to posting more regularly! So, what types of unschooling questions do you get asked? Do you enjoy educating people about unschooling, or do you find it frustrating/annoying? Is there a certain mindset you come across sometimes in those asking questions that just makes your day?